I found these tiny fairy kites at Wal-Mart the other day (for a buck!) and had to buy them. I have been wanting to do something in my craft room with fairies but really the only thing I could find (and already own) for fairies are the ones on the Tinkerbell and Friends cartridge for the Cricut. 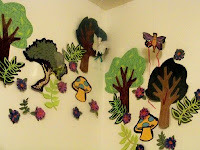 When I found these little kites I knew that I could use them in my fairyland for my craft room. Of course when I took the pictures only one of the fairies was facing the correct way at a time. The fairies are hanging from the ceiling. 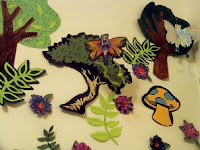 Now this is the very beginning of my fairy wall, I am sure there will be more added over time. I used the Tinkerbell & Friends cart for the solo tree and mushrooms, My World cart for the other trees and the Walk in My Garden for the ferns. The flowers are from SVG Cuts 3D Flowers (bachelor buttons). Hello my darling friend. Thanks for sharing this. I am just in aagh.. What a wonderful site and these fairies are awesome.